Charles T. Lawlor attended SUNY Geneseo where he earned a BA in History and served as Student Technical Director for College Union Technical Services. Upon graduation, Charlie accepted a position at Geva Theater; he was privileged to work with many talented designers, directors and technicians during his tenure there. 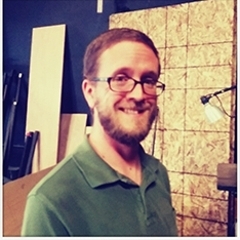 After leaving Geva, Charlie began graduate work at The University of Memphis where he received his MFA in Technical Direction and Lighting Design. Charlie has served as Technical Director at James Madison University in Harrisonburg, Virginia, Wagner College in Staten Island, New York, Premier Stages at Kean University in Elizabeth, New Jersey and School of the Arts here in Rochester. Additional professional credits include: Theater Memphis, Voices of the South, Opera Memphis, The Public Theater, George St. Playhouse, and Harborlights Theater Company. Charlie is very excited to be working with University of Rochesterâ€™s International Theater Program.